INDUSTRY.co.id - Jakarta - Two Indonesian football players, Tony Sucipto and Airlangga make an innovation in developing Indonesian culinary by creating a restaurant bus. This is certainly supported by the Director General of Land Transportation, Pudji Hartanto, supports the innovation made by the nation's children in transportation services to the public. According to him, "I support and encourage innovation from this restaurant bus, but there are some things that need to be fulfilled before operational such as test and business license, so it is important for people to get safety and comfort," he said in a press release received by Industry. Co.id, Jakarta, Wednesday (7/19/2017). But, he continued, if these requirements have not been met, I do not recommend to operate. 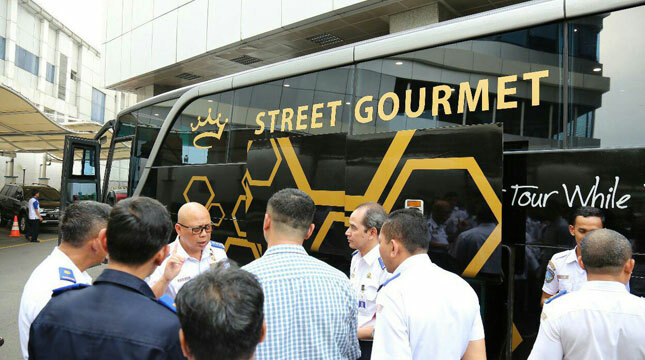 The term for this restaurant bus is Street Gourmet, is a tour bus that combines the concept of restaurant and tourism. This bus serves passengers by traveling around Bandung by serving the food available on the menu. This was revealed by Tito Afrianto, representative of the Street Gourmet bus owner. Tito said that during this time his side has been promoting this bus through social media. This received a very positive response from citizens of Bandung, and not a few of those who are interested to immediately try this bus. In response, Director General Pudji said that security and safety aspects should be a priority. From his observations on this bus, Pudji said there are some things that must be improved, among others, in terms of the feasibility of the vehicle itself, such as the physical vehicle, braking system and completeness of safety, then from the administrative side also need to get attention from operators both licensing administration as transportation Person or business restaurant licensing. In addition, Pudji also invites Local Government to play an active role in its supervision.